Pacific Wave is a successful blend of power and elegance. She has been designed to be easily handled yet she has a thoroughbred performance that makes her an extremely competitive racer. Her on-deck and below-deck layout provides spacious comfortable living ideal for charter use; her simple but sophisticated decor is an exquisite blend of practicality and elegance that only a designer of the fame of Gae Aulenti could achieve. 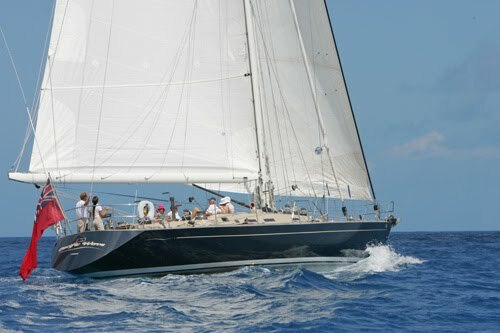 Add to that the experience of a knowledgeable owner and construction by the builder of the America's cup competitor Azzurra and the result is a reliable, refined and exciting yacht. Includes Thanksgiving, New Years, Spring Break & Easter! Pacific Wave now offers fully inclusive FREE DIVING for BVI charters. Enjoy TWO personal tailor-made 2 tank half day dives for up to 3 people. (additional divers pay $110 / half day) or ONE personal tailor-made 2 tank half day dive for 6 people. Dive only with your family and friends from private dive boats that rendezvous with Pacific Wave wherever she is anchored in the BVI. An experienced PADI Instructor accompanies the dive and can give certified instruction. All equipment included.